In the late 1840s the Washington National Monument Society, a private civic-minded organization, continued its program of soliciting funds from across the country for building the nation’s monument to its first president and added a request for something in addition to monies. 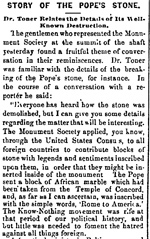 Like many European and world leaders, Pope Pius IX, or Pio Nono as he was affectionately known in his native Italy and beyond, complied with the invitation from the United States to contribute a memorial stone to be placed in the framework of the Washington National Monument as it was being constructed at the western end of the Capitol Mall. He had a black marble block measuring approximately three feet long, 18 inches high, and 10 inches deep, removed from the ruins of the ancient Temple of Concord located on the western side of the Roman Forum. Pius IX had the simple phrase "Rome to America" inscribed on the stone, which arrived in the United States in October 1853. In order to understand the events that followed upon the arrival of the Pope’s marble gift, it is important to remember that the Roman Pontiff in 1853 was still the ruler of the Papal States, a northeastward slanting swath of territory across central Italy from Rome almost to Venice, and therefore that the Pope would remain a secular power for another 17 years. News of the intended gift from the Papacy to the United States generated much hostile anti-Catholic sentiment before the marble block even reached Washington. For example, an 1852 bigoted pamphlet by John F. Weishampel entitled Rome to America: the Pope’s Stratagem! An address to the Protestants of the United States against placing the Pope’s block of marble in the Washington Monument, argued that with the increase of Catholic immigrants the Pope would eventually rule the United States. The Pope’s stone, together with monumental blocks from other countries, was stored in a shed, grandiosely called the Lapidarium, near the base of the monumental obelisk, which by that time had reached only 153 feet. And then in the very early morning of March 5, 1854 a small band of Know-Nothings broke into the Lapidarium and stole the Pope’s stone, which has never been recovered. Here is how the official history of the Washington Monument, published in the U.S. Congressional Serial Set explained the crime [Serial Set Vol. No. 4436, Session Vol. No. 21 57th Congress, 2nd Session S.Doc. 224]. 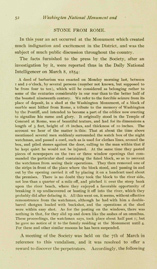 "A deed of barbarism was enacted on Monday morning last, between one and two o'clock, by several persons (number not known, but supposed to be from four to ten), which will be considered as belonging rather to some of the centuries considerably in our rear than to the better half of the boasted Nineteenth Century. We refer to the forcible seizure from its place of deposit, in a shed at the Washington Monument, of a block of marble sent hither from Rome, a tribute to the memory of Washington by the Pontiff, and intended to become a part of the edifice now erecting to signalize his name and glory. It originally stood in the Temple of Concord at Rome, was of beautiful texture, and had for its dimensions a length of three feet, height of eighteen inches, and thickness of ten inches. The account we hear of the matter is this: That at about the time above mentioned several men suddenly surrounded the watch box of the night watchman, and passed a cord, such as is used for clothes lines, around the box, and piled stones against the door, calling to the man within that if he kept quiet he would not be injured, at the same time they pasted pieces of newspapers on the two or three window openings that commanded the particular shed containing the fated block, so as to prevent the watchman from seeing their operations. They then removed one of the strips in front of the place where the block stood, and passing in and out by the opening carried it off by placing it on a hand cart used about the premises. There is no doubt they took the block to the river side, not less than a quarter of a mile off, and pitched it over the steep bank upon the river beach, where they enjoyed a favorable opportunity of breaking it up undiscovered or boating it off into the river, which they probably did after defacing it. All this went on, it seems, without effective remonstrance from the watchman, although he had with him a double- barrel shot gun loaded with buck shot, and the operations at the shed were within easy shot. As for the pasting on the windows, there was nothing in that, for they slid up and down like the sashes of an omnibus. These proceedings, the watchman says, took place about half-past one; but he gave no notice of it to the family residing at the Monument until four. For these and other similar reasons he has been suspended." "$100 REWARD. The Board of Managers of the Washington National Monument Society will pay the above reward of $100 for the arrest and conviction of the person or persons who, on the night of the 5th instant, stole and destroyed a block of marble contributed to said Monument." Further details about this crime, which were presumably not available to Frederick Harvey, were in fact later recounted by Dr. Joseph Meredith Turner, a learned Washington, D.C. physician and local Washington historian. Here from, of all places, the Wheeling Register of Dec. 9, 1884 is his further explication of the sad and embarrassing event in the history of our Capitol. As a result of the scandal of the Know-Nothings’ vandalism, their stealing of the stone, breaking it into pieces and hurling them into the Potomac River, the Washington National Monument Society appealed to Congress for assistance. But just as Representative Henry May of Maryland was about to submit a report in favor of appropriating $200,000 to assist in the continued construction of the Monument, news of a fraudulent takeover of the Monument Society by the Know-Nothings reached Capitol Hill and the motion was tabled. The Know-Nothings controlled the Society until 1858, when they abandoned the cause, or their version of it. In 1870 at the First Vatican Council, Pope Pius IX had himself, and his successors, declared infallible in matters of faith or moral doctrine, but alas his stone had not been infriable. Three subsequent posts over the next several months will further explain the heated background of some of those events which led to the barbarous incident of the theft and destruction of the Pope’s stone, recount the story of the completion of the Monument [with a curious 2010 epilogue] from the popular press and official government documents, and conclude with the eventual replacement of the papal marble in the Washington Monument more than a century after Pius IX’s original gift.